Manage Your Money In One Place! Money Management allows you to see all your accounts, including those with other financial institutions, all in one place! Plus, you can easily track your spending, set budgets, set goals, and much more, all for free! Want to sign up for Money Management? It's easy! Simply click here for a step-by-step guide. Q: Why would I want to add external accounts to my online banking? Our goal is to help you improve your financial lives and to help you see your entire financial picture. That way you can spend less time worrying about money and more time enjoying the security and comfort it affords you. Q: I’m having trouble with one of the features. Help! The easiest, most comprehensive way to get information about Money Management is to click on the “?” icon in the upper right part of the screen. That brings up the Help guide and is broken down by topic. Still having issues? Click the blue button that has an envelope icon and says “Request Support.” Explain your issue. MX, the company that provides Money Management, will get back to you via email. They have a very quick turn-around time! Q: How can I connect my First Citizens Credit Card? I’m having trouble finding that. In the search area of the “Add Accounts” section, type in www.mycardstatement.com. You’ll then be able to enter your Username and Password that you’ve previously set up for your First Citizens Credit Card. If you need further assistance with linking your card, please call us at 800-423-1602. Q: What is the best way to make Money Management an effective tool for me? There are four easy steps that can help you get the most out of Money Management. Add accounts from other institutions so you can view your whole financial picture in one place. Nearly any financial account can be linked! Checking and savings accounts, investments, credit cards, loans, mortgages and other lines of credit can all be added. You can also easily track Cash or Property Values by adding manual accounts. Note: Property accounts are important in New Worth for tracking your high-value assets, such as your house or vehicles. Transactions will be automatically cleansed for readability, and categorized to make it easy to see where your money is going. However, not all transactions can be automatically categorized, so it’s important to review transactions regularly. For example, checks and ATM withdrawals will be left “Uncategorized,” and you will be prompted to assign a category for such transactions. Make any changes necessary to ensure your spending data is complete and accurate. It can be helpful to review your Spending chart after reviewing your Transactions. You will better understand how your transaction categories influence your financial reports, and can often reveal spending details that need to be re-categorized. A budget makes it easy to visualize how much you’ve spent and how much money you have left for the month. 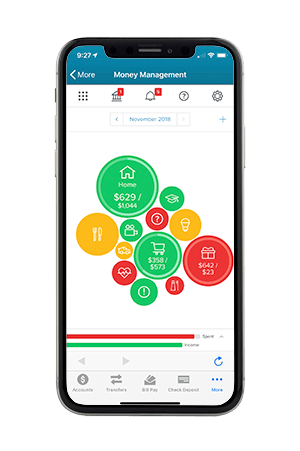 Select “Auto Generate Budget” to let Money Management calculate your average monthly spending in each category for the last two months with complete data. This gives you a realistic starting point for your budget. Note: An auto-generated budget will be more accurate and helpful if you first add any outside accounts and review your transactions so that your budget calculations are based on a full and complete spending history. Alerts can keep you notified of important things happening with your accounts, like a low balance or upcoming debt payment. By default, “simple alerts” are enabled, which means you’ll receive the following alerts on the Notifications tab, via email and mobile: large deposit (over $500), large expense (over $100), balance falls below $100, you get charged a fee, you have a debt payment coming up, or you have exceeded a budget. You can modify these alerts by clicking on the gear icon in the top right hand part of the Money Management screen. Q: I don't have time to manage my finances. Money Management will save you time in the long run. In five short minutes, you can get your accounts set up. Once they are added, you can quickly and easily see all the detail you need about your finances, whenever and wherever you need it. Q: I only bank here, so I already see all my accounts in one place. Wow! We appreciate your loyalty! Since your accounts are all here, they'll be added to Money Management automatically, so you can already track your spending and net worth, or set budgets or goals if you want to take it to the next level. Q: How can it be safe to keep all your accounts in one place? Security is a top concern for us too. Money Management is secured inside Online Banking, and uses extra-strong military level encryption to protect your data. The biggest security risk is usually at the user level - the best things you can do to protect yourself are to keep software updated, and never log in to Online Banking from an unsecured WiFi network.